> Do Pool Covers Heat the Water? > Do Pool Covers Stop Evaporation? > Do I Need a Cover Roller? You are at:Home»Category: "News & Announcements"
Yet another reason why our pool cover will make your pool stay warmer and cleaner. Industry leading Pool + Spa magazine has published our AquaBlanket Solar Pool Cover and Cover roller in their magazine. 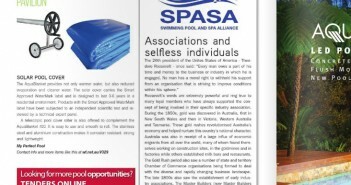 The magazine is distrubuted to pool industry professionals Australia wide. Do You Need to Register Your Pool?